When choosing bridesmaid dresses, one of the goals is to ensure that they fit the wearer’s aesthetic. On the other hand, making them as versatile as possible is essential for giving bridesmaids various customizable options regarding the dress, especially if there are different body types within the bridal party. Additionally, it is helpful to make a number of practical choices according to factors such as the type of wedding and weather conditions. It is important to remember that the same type of dress might not suit everyone. It can be challenging to find a dress that will fit several body types. While you may be able identify one that fits multiple people well, it may not be ideal for others. Keep this in mind as you shop around for a dress that can be regarded as universal. For example, a dress that features a defined waistline is suitable for an hourglass figure whereas a pear shaped individual may look better with a fuller skirt and fitted top. An apple shape looks great with items that draw attention upwards and a larger upper torso will benefit from a voluminous hip for balance. · One of the ways to ensure that a bridesmaid dress is versatile is by selecting a sophisticated, classic style. Trends can be fun but if they are currently out of style, they will not work well. · Picking something classic is an assurance that the bridesmaid will be able to wear the dress for years to come. For example, a minimalist dress that features a stylish hem will remain in style. Click here for bridesmaid dresses Columbus Ohio. · You can also opt for retro looks like dresses with flared skirts, fitted tops and high waists. While trendy patterns may be a good idea right now, the floral print that you currently adore might not be impressive in the next 10 years. A solid color, for instance, will always be in style. Pick a suitable group of colors or color. When picking a color, think about the things that look good on most people. For example, dark colors can be more flattering than a lighter hue, depending on the circumstances. Colors such as navy blue are also more wearable in the future. Do not hesitate to change your mind if the need to do so arises. You might have a particular style in mind. However, when a number of bridesmaids try it out, you may realize it is not a suitable look for everyone. 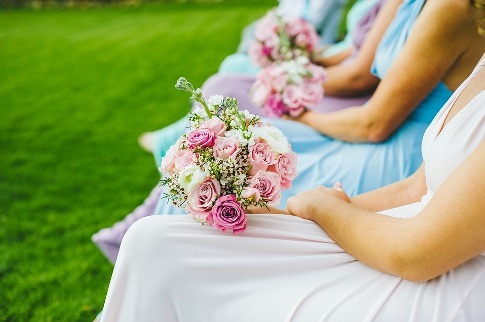 You can make a change in order to ensure that the bridesmaids are comfortable. Select lighter fabrics for warmer seasons. If you are preparing for a summer outdoor wedding, it is advisable to pick a fabric that will not overheat. Good choices include chiffon and organza fabrics that allow the skin to breathe and keep bridesmaids comfortable during the occasion. Warm fabrics are ideal for the cooler months. Whether or not the wedding will be indoors, you are likely to take a number of wedding pictures outside. Consider this while choosing the fabric for dresses. Satin or silk are heavier fabrics that are good options for winter.